My carnivore boyfriend (boyfriend carnivorus) said that there was no way to get a good photo of seitan and tofu “turkey”, a.k.a. loaf. I wasn’t so sure. The worst you can say about loaf’s looks is that they’re bread-like, which sounds a-ok to me. It’s also tasty. And with the photographic evidence above, I dare say photogenic. What more could you want in a main course? I know some meat-eaters are confused by things like this. I can understand that. Why stop eating turkey just to go through all the trouble of creating a fake one? Protein, for one. Just because you give up meat doesn’t mean you don’t want that hearty, dense, toothy feel of protein. It helps you feel satisfied and keeps hunger at bay long after the dishes are done. I also think it’s comfort. I want to make the recipes I loved as a kid. Ninety percent of my favorite pot pie recipe is naturally vegetarian. Swapping in a little diced loaf for the turkey doesn’t seem all that different than subbing mushrooms for lima beans. 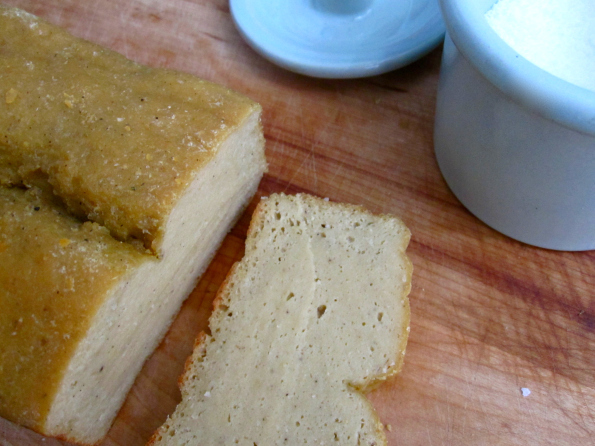 The original recipe for this comes from Bryanna’s vegan Thanksgiving site — she has lots of great side dishes and different variations on her basic tofu and seitan recipe. I took the “turkey” one and modified it quite a bit in both ingredients and cooking method to make it a little easier to whip up and with the flavor coming more from broth and herbs than soy sauce. It’s a pretty simple prep. Blend together some tofu and broth. Add it to some wheat gluten. Mix. Bake. I was totally intimidated the first time I made it. Bryanna’s instructions are super detailed and I can be kind of bad with details (which is why I wound up simplifying this recipe a whole lot) but it turned out great and each one after that has as well. This recipe is forgiving and pretty much fool-proof. Not that you need that, because clearly, you ain’t no fool. 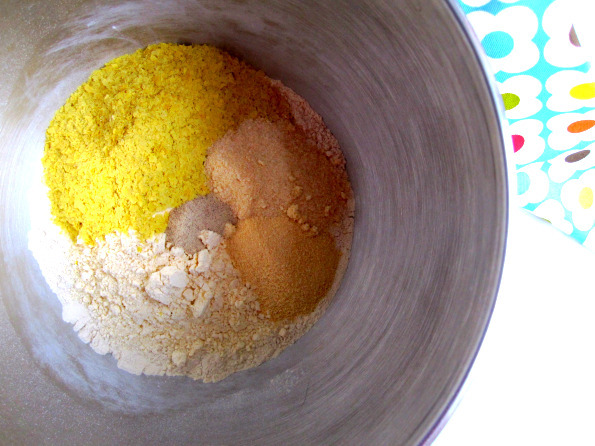 Mix all the dry ingredients in work bowl of Kitchen Aid (or other mixer) or mixing bowl. Give it a quick whisk to incorporate. Combine all the wet ingredients in blender. Blend for 30 seconds or until completely smooth. You want the tofu to be fully broken down. It should look like a smoothie. Pour the wet ingredients into the dry and mix together. Dough will be wet. Turn out onto a cutting board and knead for about 5 minutes. Shape into loaf, put in oiled bread pan and let stand for another 5 minutes. Make basting broth by combining all ingredients. Use hot water or warm slightly on stove. When dough is finished resting, baste with one or two baster squeezes of broth. Put in oven. Bake 1 hour. Dough will feel firm to the touch and nicely browned. Broth should be completely absorbed. Let cool for :15 minutes before serving. This entry was written by haikugirl, posted on September 23, 2010 at 8:18 am, filed under Tofu, Vegan Friendly. Bookmark the permalink. Follow any comments here with the RSS feed for this post. Post a comment or leave a trackback: Trackback URL. Oh, but it smells so dubious during preparation! It’s the yeast! They are to blame! I love this recipe! Thank you so much for posting it! Yay! It’s a total staple ’round here. I call it LOAF, all caps, because it’s that delicious! Please, please, may I ask, what size package of tofu? Thanks! It looks really good! Sorry for the late reply! You went into my SPAM folder. LAME! It’s a 15 ounce package of tofu. Hope that helps! Wow! I finally gathered up the ingredients and/or substitutes and made it last night. I subbed in this fashion: instead of chickpea flour, I used 1/2 cup of chickpeas, added to the blender with the liquid mix; instead of poultry seasoning, I used Old Bay seasoning; instead of pepper, I used a little less than 1/2 t of paprika. Oh! and just for fun, I used a fork to poke holes in the dough before I baked it. I was thinking it might make the basting juices soak into the ‘meat’ more thoroughly. I do not know if my modifications made any difference whatsoever, but I think this is my new favorite mock meat. I repeat: wow! I’m glad it turned out! I like your idea of actual chick peas instead of chick pea flour. No need to buy a big bag of that flour if you only need a little big! Very smart. The holes is a good idea, too! I’m doing that next time! I use Loaf to make Loaf Noodle Soup. OMG, it’s so good. If you were wondering, it holds up in soup great! Oh, oh! I failed to mention, the texture was like turkey. The taste, like turkey! It even. Looked. Like turkey! Thanks! Let me know whether or not the holes add to your already successful results? I totally agree; best part is that it’s not turkey. Turkeys are for strutting around being beautiful. They are pretty, aren’t they. When people say they aren’t, I wonder about their tastes. I will let you know if the holes change things. I’ve been meaning to make this for a while now! It works great cubed in “chicken” noodle soup and it’s getting cold in Seattle. Soon! Have this in the oven right now, it’s Thanksgiving weekend for us Canadians. I am wondering though, you say baste at 30 mins then bake 1 hour. Is that baste at 30 mins and bake a total of 1 hour or baste at 30 mins and cook another hour for 1.5hr total. I am thinking 1 hour total. Smells good so far, can’t wait! O! I hope you figured it out! When it’s done it looks done, which is nice. And the texture is more firm if you press on it. The basting is pretty forgiving, I think. I almost think it’s more of a fun thing to do than it is necessary to it’s deliciousness. It’s kind of nice to have something to futz over, you know? Hope you had a wonderful Thanksgiving! I think as long as the liquid is in there, you can’t overcook it too much. Famous last words? If it’s brown and feels firm to the touch, you can probably take it out even if there is liquid though and remove it from the pan. It’s hard to mess up — at least it’s so far seemed pretty forgiving in my kitchen experiments. Good luck — let me know how it turns out! It turned out great–thanks so much! i see the sub idea for the garbanzo flour…. i was hoping there would be a sub! Have all my stuff together except that! has anyone tried any other sub for the garbanzo flour? Yay! I love it a lot. I feel on top of the world when I have a log of it in the refrigerator! It’s true. THANK YOU! being new to veganism, i wanted try several “turkey” recipes before i had holiday guests so as to be able to make a good “turkey” dinner when the holidays actually arrive…this is the first recipe i tried, and i need look no further……it is excellent!! my son is a chef at a high-end restaurant…i bet he will be surprised at how good and “realistic” this tastes…again, thank you! I’m so happy you like loaf! It’s great, easy to make, can be used in lots of stuff. I hope it makes your vegan aventures all the more tasty and protein packed! Excellent! this was wunderfullllllll!!! thank you!